Seems like everyone wants to build a pipeline these days. I’m sure almost everyone has heard about the Keystone XL pipeline, and our Mobile Group has done a good job of publicizing their opposition to the oil pipeline to be constructed through a major water supply area for the city of Mobile. But there are several other pipelines being proposed for Alabama. One of these is the so-called Sabal Trail Pipeline that would carry natural gas extracted through hydraulic fracturing from Pennsylvania and Texas through Alabama, Georgia, and Florida. 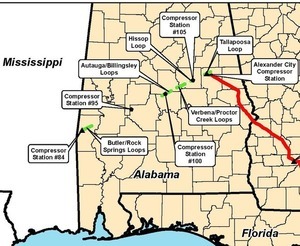 The new pipeline would begin in Alexander City, where it would join with the existing Transco pipeline (which extends from Texas to New Jersey and Pennsylvania), and continue approximately 460 miles through southeast Alabama, southwest Georgia, and Florida, to supply natural gas to power companies in central Florida. Additional branches and expansion of the Transco pipeline make the total project about 650 miles long. This includes the Hillabee Expansion of the existing Transco pipeline in Alabama, from the state line in Choctaw County, through Autauga, Chilton, Coosa, and Tallapoosa Counties. Its purpose is to expand the capacity of the Transco pipeline by adding approximately 44 miles in eight pipe segments, or loops, adjacent to the existing pipeline. Several new pumping stations would also be constructed along these pipelines. The Alabama Chapter of the Sierra Club has joined with the Georgia and Florida Sierra Club Chapters to oppose the Sabal Trail Pipeline. Since the purpose of the Hillabee Expansion project is to supply gas to the proposed Sabal Trail Pipeline, we also oppose the Hillabee Expansion project, and consider it undesirable and not needed. The proposed pipelines would cut a wide swath through pristine lands with resulting negative impacts on endangered species, critical wildlife habitat, invaluable wetlands, longleaf pine forests, the fragile and irreplaceable Floridian Aquifer, streams, rivers, and springs, and private property rights. If approved, the pipeline companies would attempt to acquire easements through private property in the path of the pipeline, and could use condemnation proceedings through “eminent domain” to force unwilling landowners to provide easements. Furthermore, the Sierra Club and other environmental organizations are also opposed to the hydraulic fracturing process by which natural gas is extracted for transport in these pipelines. Although natural gas is promoted as a cheap source of energy, its true cost is not revealed. It is a fossil fuel that increases global warming, and has a high environmental cost for production. 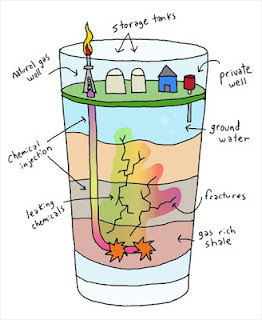 Hydraulic fracturing, or “fracking”, is a destructive process of drilling for and fracking of shale deposits that contaminates drinking water resources in nearby communities, and requires excessive amounts of water, which has become a precious limiting resource in many areas. Fracking has also been linked to birth defects in peer-reviewed studies. Thus the true cost of producing cheap natural gas is not paid by the drilling companies, but is passed on to local communities which suffer from degraded environments, water quality, and property values. And much of the fracked natural gas is exported to other countries. For these reasons, many environmental organizations, including the Sierra Club, have called for a total ban on fracking. Another concern is that the pipeline companies involved with these projects have poor records for safety and environmental violations. Spectra Energy and its related companies have been fined repeatedly for safety and environmental violations throughout the United States including one fine of $15,000,000. Williams Partners, Inc., owner of the Transco pipeline, has a poor record of pipeline safety, and has had at least 35 reportable accidents since 2006, including the pipeline rupture and explosion on December 3, 2011, near Linden in Marengo County, Alabama. Fortunately this explosion, which devastated 65 acres of forest land, did not occur in a populated area where loss of life could have been tragic. Williams Partners and other pipeline companies should focus on upgrading the existing pipelines for improved safety rather than expanding capacity. Florida, which will be the sole recipient of the fracked natural gas to be transported through the Sabal Trail Pipeline, should expand energy efficiency measures and solar power capacity rather than increase its dependence on natural gas. And rather than approving construction of new pipelines, the Federal Energy Regulatory Commission (FERC) should be promoting increased use of renewable sources of energy, such as solar and wind power, and should also encourage improved energy efficiency measures. 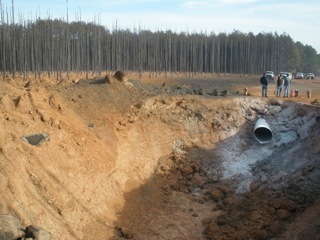 Additional information regarding these pipeline projects may be obtained at www.sabaltrailtransmission.com and www.ferc.gov.